PARANORMAL-GRUNGE THRILLER: A specific form of Mystery sub-genre, similar in generalities to sub-genre definitions such as “Cozy,” or “Y.A.” but with distinction of slightly darker elements and situations as well as being set specifically in the “grunge-era” of the 1990s; Paranormal-Grunge Thrillers also include a supernatural element, and may be widely classified as a mystery or thriller, by which the main character (generally the author in his/her teen or college years) must solve a crime or puzzle. 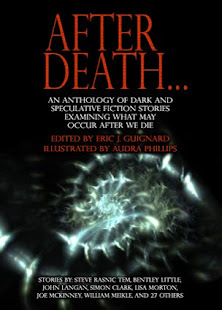 A proto-Paranormal-Grunge Thriller is the novelette by Eric J. Guignard, “Up at Spadra, Where the Dead Don't Exist” (2018). Publishers forthwith rejoice! I am offering you the chance for a unique and (*potentially*!) soon-to-be-wildly-successful market! 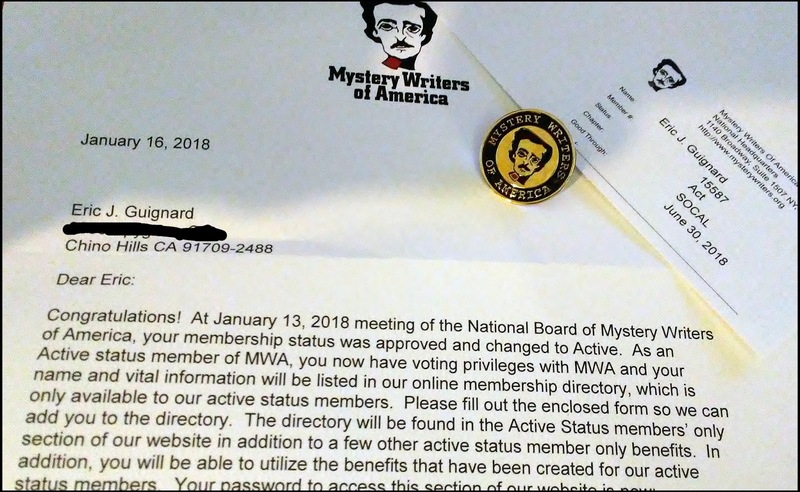 Just received my Active Writer acceptance into the Mystery Writers of America (MWA). 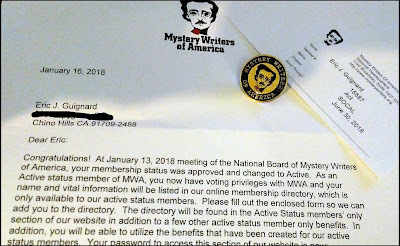 Pleased and excited to join this org that’s been around since 1945, promoting mystery and crime thrillers! 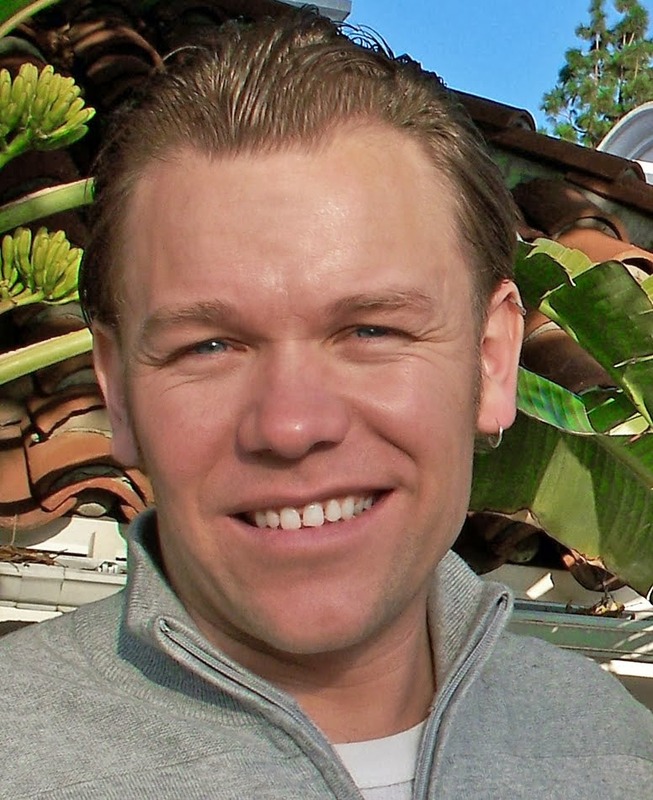 Additionally excited to be part of the regional So Cal. Chapter of other local writers, and look forward to attending their L.A. events once in a while. Payment: $100 for flash fiction. $500 for short stories. 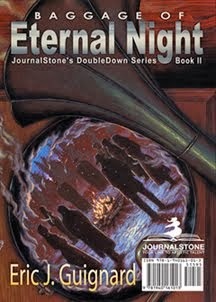 Description: Speculative fiction and Weird fiction. EX: Space cowboys with a flair for ballet, bored zombies with 9-5 jobs, an alternate history where Hitler and Gandhi switch places. Description: Christian-themed speculative stories--science fiction, fantasy, horror--with Christian themes, characters, or cosmology; science fiction and fantasy, good ghost stories, etc. ; there's great fiction material hidden in the mysteries of Christian theology--cherubim, leviathan, nephilim, visions, prophecy, and more. Description: Short speculative fiction that considers the future of the internet, artificial intelligence, the mind, and robots. Give us your optimistic, fantastic, bittersweet stories of fantasy and science fiction. Description: Imaginative, good speculative fiction, broadly defined (not pure horror), particularly from diverse perspectives; Unusual yet readable styles and inventive structures and narratives. Payment: Minimum $250 per story, possibly with more depending on crowd funding. Response: YA stories from established and emerging authors. Story titles should be one word in length and act as a clue (foreshadowing) to the story’s premise. 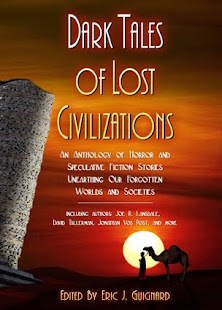 Description: An anthology of original short fiction that explores the physical and metaphysical boundaries between humanity and the natural world. Fantasy or literary short works, speculative fiction (broadly defined); stories should involve nature and the weird at their core; how the author wishes to interpret these themes is entirely up to them.